User profile consists of web pages that will be requested during test run. To add pages to a profile, you can record the real activity in browser. This can be done using WAPT Pro Recorder. This tool records your actions as you navigate through a web site and then reproduces these steps during test run. 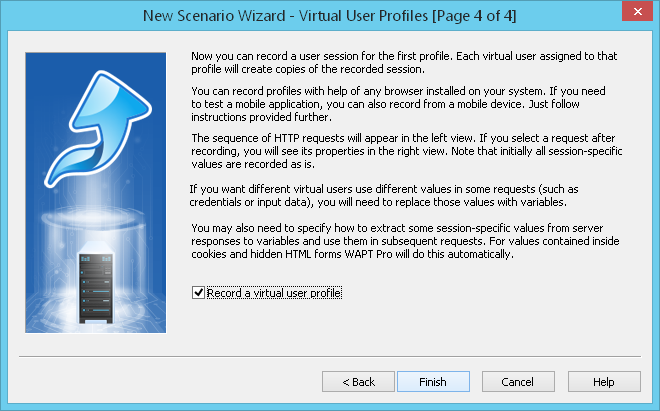 Record a virtual user profile: Using this option, you can start recording immediately after the completion of this wizard. You will see the Recording Options dialog where you can specify a profile for recording and then start the recording. This is the last page of New Scenario Wizard. Click Finish to create the scenario with the specified parameters. Or you can click Back to return back and change parameters.